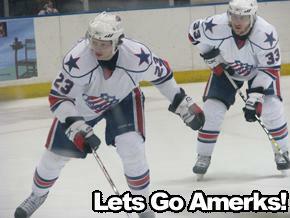 Amerks Stomped by the Moose · Let's Go Amerks! The Amerks lost yet again to the Manitoba Moose, this time by the final score of 4-1.Â The Moose have won the past 11 contests between the two teams dating back to the 06/07 season.Â The two teams play again on Friday night at Blue Cross Arena. Clark MacArthur had the first scoring chance of the game as he hung out around the opposing blue line, received a pass and went in on a breakaway against Moose goalie Drew MacIntyre but was unsuccesful. The Moose must not have been paying attention to the system the Amerks have been playing.Â Moments after MacArthurs attempt, Tanner Glass (4th goal of the season) was left all alone at the same opposing blue line when he scored off of an assist from Marek Zagrapan (18th assist). The only other Amerk related highlight of the game was when Luke Beaverson, playing in his firstÂ professional game, got into a fight with Greg Classen of the Moose.Â A video is being uploaded to YouTube and will be posted on Thursday. Drew MacIntyre saved 23 of 24 shots by the Amerks, not many of those 23 shots would’ve been considered great scoring opportunities.Â He is ranked 5th amongst goaltenders in the AHL. The Amerks only had one power play opportunity against a disciplined Moose team that didn’t get frustrated and start making sloppy plays as the Amerks did in the third period. Newcomers Luke Beaverson, Mike Kositka, and Tommy Goebel all played well.Â It should probably be noted instead that they didn’t make any bad plays. Fresh off a short stint with the Buffalo Sabres, Mike Funk made sloppy play that allowed an open Greg Classen to scoreÂ on the power play which turned out to be theÂ game winning goal. Martin Lojek was a healthy scratch, as was Dan Collins who seems to have disappeared. The two teams face off again on Friday night at 7:35pm at Blue Cross Arena for there final meeting of the season.